How do I prevent galvanic corrosion in my packing gland? Galvanic corrosion is an electrochemical process that occurs between two dissimilar metals, or between a metal and a conductive non-metallic material, when both are exposed to an electrically conductive media. In the case of a packing gland, it occurs between a metal component and the carbon or graphite packing. Under these conditions, the material that is closest to the anodic end of the galvanic scale will be corroded in preference to the one that is closest to the cathodic end of the scale. (See Table 1.) As the distance between materials on the galvanic scale increases, a corresponding rise occurs in the rate and the extent of the corrosion. In a valve or a pump using packing made of either graphite or carbon, a galvanic reaction may be initiated as soon as any electrically conductive fluid, such as water, is introduced. Since graphite is more cathodic than the metals that make up valves and pumps, it is the metal that may be subject to corrosive attack. Even though a valve or pump may be packed with a graphite or carbon packing, many cases exist in which the metal parts will not be subjected to galvanic corrosion. For example, an electrically conductive fluid in a liquid state must be present for the galvanic reaction to take place. The temperature of a superheated steam valve prevents the accumulation of any significant amount of water, thereby nullifying the possibility of galvanic corrosion. Another example of when galvanic corrosion protection may not be necessary is when the equipment is constructed of austenitic stainless steels (e.g., 300 series, 630, etc.). These stainless steels are much more resistant to galvanic attack. On the other hand, the martensitic stainless steels (e.g., 400 series) are highly susceptible to galvanic attack. If a valve or pump is constructed of martensitic stainless steel and if it will be exposed to an electrically conductive fluid for any period of time, then consideration should be given to incorporating a galvanic corrosion inhibitor system into the carbon or graphite packing sets used to seal it. When Are Corrosion Inhibitors Needed? Two galvanic corrosion inhibitor systems are commonly available for use in compression packing. They have a common goal of nullifying the effects of galvanic corrosion. However, they are based upon two different protection mechanisms. Active, "sacrificial," inhibitor systems are based on the principle that the galvanic reaction will preferentially attack the material that is most anodic. As long as this most anodic material remains in contact with the conductive fluid, it will be attacked and corroded in preference to the other metals or materials present in the stuffing box. The active inhibitor systems provide, as part of the packing set, a metal of a more anodic nature than that of the material used in the construction of the valve. The most common active inhibitor system used today is zinc powder. 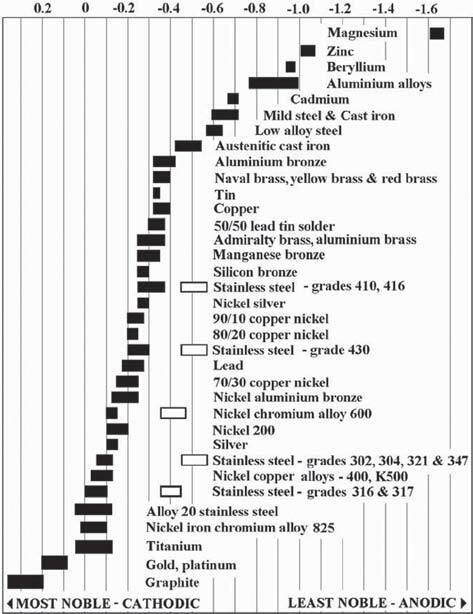 Being located near the extreme anodic end of the galvanic scale, zinc is more anodic than the metals that are commonly used in valves and pumps. A zinc powder coating can be easily applied to the surface of many different types of compression packing products including die-formed flexible graphite rings and nearly any type of braided carbon or graphite. When zinc powder is applied to the surface of a packing material, it appears as a light grey coating. Care should be excercised in the case of equipment that may see service temperatures that exceed the 419-degree-C (786-degree-F) melting point of zinc. At temperatures above its melting point, zinc may contribute to the liquid metal embrittlement of the base metal. Passive corrosion inhibitor systems protect the metal surfaces of equipment by forming a barrier film on the more anodic metal component. The graphite packing and the metal surfaces must be exposed to each other through an electrolytic fluid medium for a galvanic corrosion reaction to occur. The passive inhibitor creates a continuous thin barrier film through which the galvanic reaction cannot occur. Several manufacturers make grades of flexible graphite that incorporate phosphorus as a passive corrosion inhibitor. These inhibited materials can be used in many forms for both compression packing and gasketing products. The phosphorus is dispersed throughout the material during processing of the flexible graphite sheet from which the packing is fabricated. It is not just on the surface of the packing. Phosphorus based corrsion inhibitors can be used for applications in which zinc may not be allowed, such as high temperature services above its melting point or cases in which zinc may not be compatible with the process fluid.